If you’re looking for a track day weapon, there’s a plethora of sportbikes that’ll fit the bill—straight off the showroom floor. But with such a saturated market, it takes something truly exotic to go fast and turn heads. 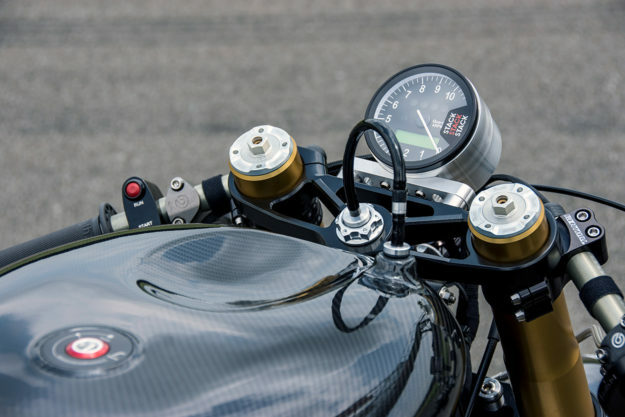 South African Gareth Evans knows this all too well; his track bike isn’t a brand spanking new Japanese or Italian. Instead, it’s a little bit of both—in the form of this maniacal two-stroke hybrid. 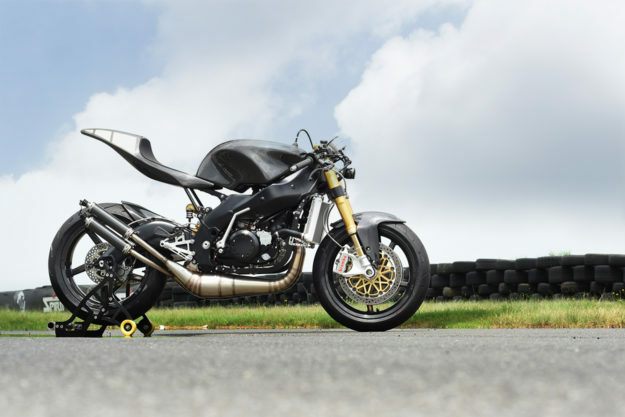 Gareth’s plan was to build a two-stroke racer that would not only look and sound good, but also have the performance to match. His thoughts initially turned to two legendary two-stroke powerplants—Suzuki’s RG500 square four, and Yamaha’s RD500. But after some research, he decided to go for a simpler and lighter twin. 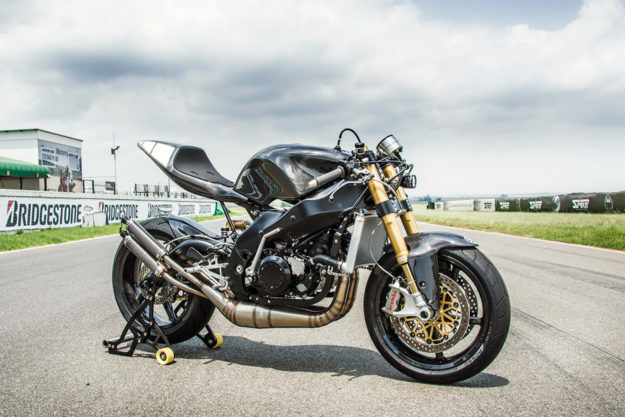 Picking a chassis was far easier; Gareth rates the Aprilia RS among the prettiest 250 production racer frames made, with some of the nicest suspension parts. What’s more, he’d seen this conversion done before. Ironically though, he ditched all but the 2000-model Aprilia’s frame and swingarm, opting to upgrade the brakes, wheels and suspension. 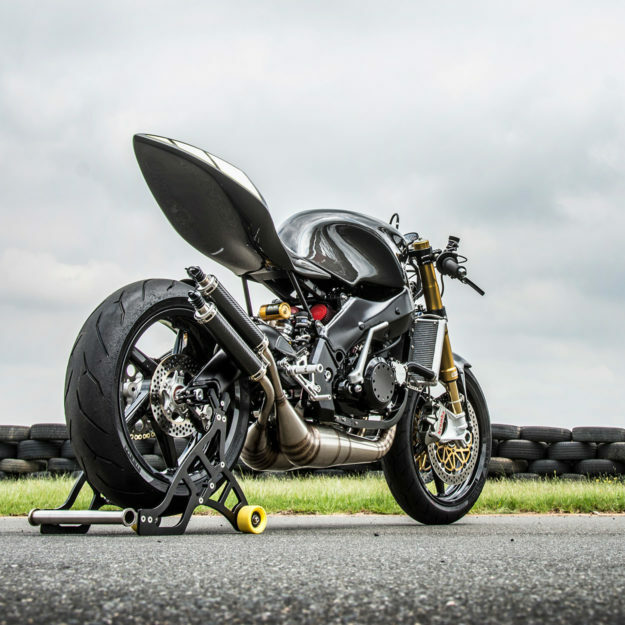 Up front is a set of race-spec Öhlins forks from a Ducati Panigale, matched to an Öhlins TTX rear shock. Since there’s no TTX unit that fits the RS specifically, Gareth had to fabricate his own bottom clevis. There’s also not much left of the Yamaha’s original engine—or rather, engines. Gareth started with four complete motors, and a brand new Banshee casing (identical to the RZ). But the casing had terrible casting marks, so he spent forty hours sanding and filing it by hand. Naturally, he then decided to replace all the internals. 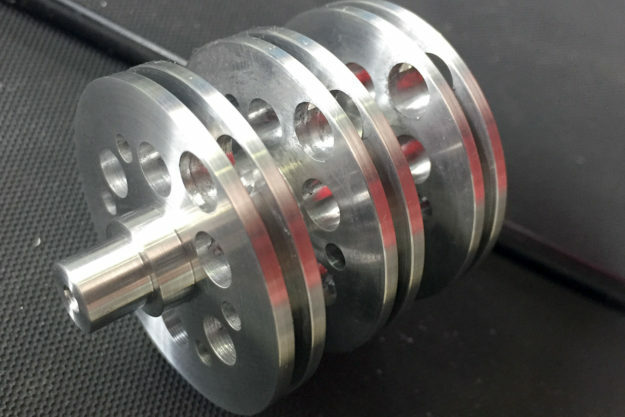 Inside, you’ll find Athena barrels with Wossner pistons, a Hinson billet clutch with straight cut primary gears, a Hot Rods Stroker crank, upgraded bearings, an offset output sprocket, and a new adjustable ignition system. Plus there’s extensive porting and matching work on the cases and cylinders, and the engine is set up to run on low-lead Avgas. Whew. The carbs are Keihin PWK motocross numbers, fed by BMC filters via custom intakes and V Force 4 reeds. 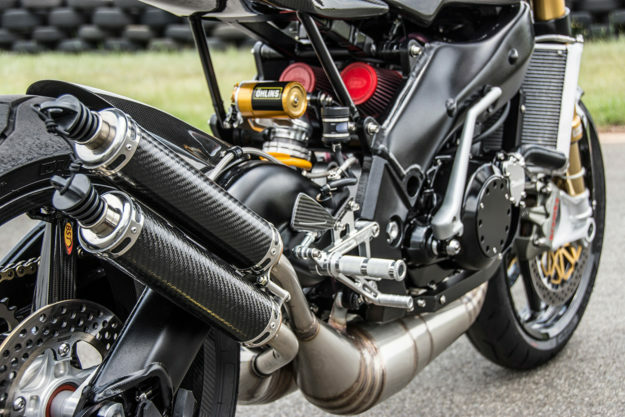 The pipes are from Jim Lomas, and the radiator was dispatched from H20 Performance in Italy—a custom part based on a 3D model created by Gareth. There’s also a custom-made water expansion bottle hiding under the tank, with a Gilera Runner pressure cap. Gareth is a fitter and turner by trade, with a background in mechanical engineering studies. 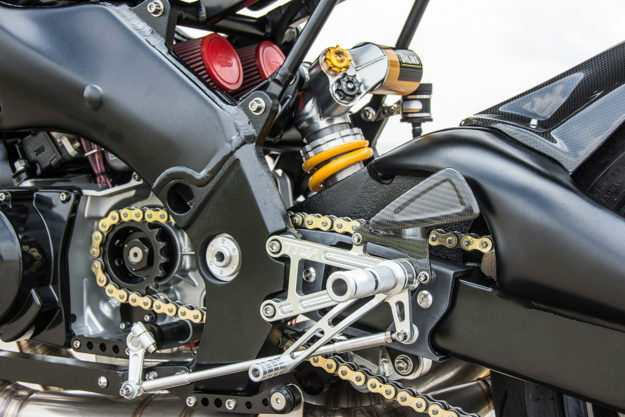 So the number of one-off parts on this build is staggering: the triple clamps, neck pin, rear axle, swingarm pivot, and rear brake carrier were all machined from 7075 aluminum. Plus all the spacers and lock nuts. 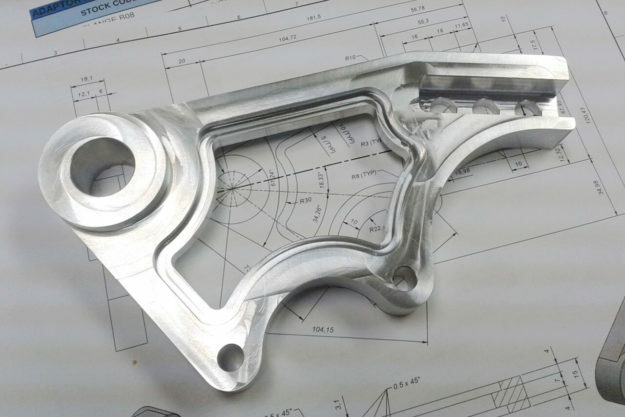 Even the chain slider was CNC’ed from a polyethylene billet off a 3D model, since Aprilia no longer manufactures the original part. And every single nut and bolt on the bike is titanium. For controls, Gareth fitted a set of Renthal clip-ons and Tyga rear-sets with subtle modifications. There’s a Domino quick-action throttle too, hooked up to a homemade, three pulley splitter system. The wiring harness is all-new and all custom too, put together from the type of wiring used in aircraft and satellites—just to save a few extra ounces. It runs off an Aliant Lithium-ion battery, which Gareth has to charge at home, since the bike has no charging system. There’s a Stack ST700 gauge up top, in a custom aluminum housing. 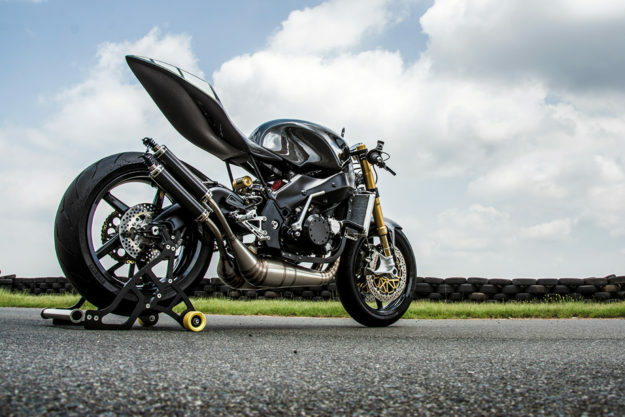 Capping everything off is a homemade subframe, and a full complement of carbon fiber bodywork—including a tail section that would make Sir Mix-a-Lot proud (it weighs less than a kilo, by the way). I honestly can’t figure out what I’d like more: to hear Gareth’s Yamaprilia at full tilt, or to see the reaction of track day sportbike owners when Gareth gets on the gas and reels them in.